Tuesday, Jan. 10th, 2018 ~ 10:30 am - 12:00ish with Terri and Pat "Home Sweet Home"
There's only one way to describe this original Kimberbell design - stinkin' cute! The vintage-style high top can be sewn in team colors or cotton prints. Personalize the medallion on the shoe with the name or jersey number of your player. Thread real shoelaces or ribbon to tie it up. 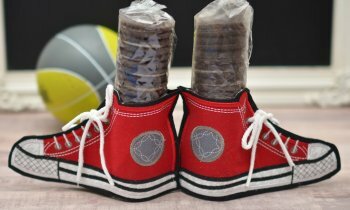 Sleeves of cream filled cookies fit just inside for the sporty striped socks. 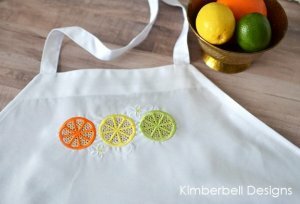 With lacy citrus slices and a delicate white blossoms, this beautiful cutwork apron makes me think I should invite ladies for lunch. I'll serve chicken salad on tea sandwiches with key olime tarts for dessert and all the while everyone will admire my lovely apron. With fabric and vinyl applique, we've created a lemonade glass that's always half full. 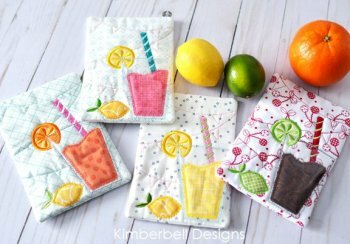 Stitch the quilted pennant background in a contrasting color for celebration or blend with the background fabric to emphasize the drink and slice of citrus garnishing the cup, like our cherry cola with lime. You'll find this mouthwatering design delish for an entire mixology of sodas. Did you ever count the days of summer in popsicle sticks? This Kimberbell original Embroider by Number project has us reminiscing of summer vacation when the only thing on our-to-do-list was "PLAY." 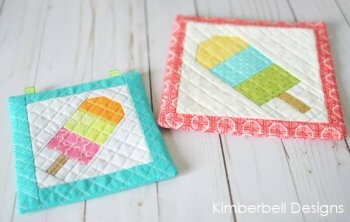 With three layers of icy sweetness, the pieced popsicle block features crosshatch quilting on the large and medium sizes with optional ribbon loops for hanging. 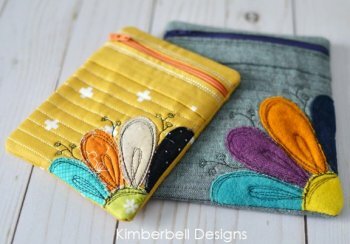 The small size is just right for a pincushion or coaster. Featuring a sophisticated combination of textiles like linen and wool, the Flower Zipper Clutch comes in 3 sizes. From durable cork to dainty calicos, create your own aesthetic by trying a different fabric for each petal. Unlike traditional machine embroidery applique, where the design is secured with a satin stitch, raw edges of the pretty petals are surrounded with whimsical outline stitches. The clutch is fully lined, plus Kimberbell makes installing a zipper so remarkably easy in-the-hoop project. Witch hats and spiders and pumpkins, oh Mylar! Machine embroidery is our favorite new way to decorate. These designs will definitely add sparkle to your Halloween party. 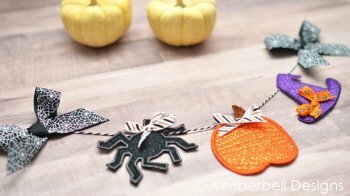 String several of the shapes together for a ghoulish garland, use as a gift bag topper or accent for scrapbook pages. If the occasion calls for pie making, we keep the recipe simple with this math equations. 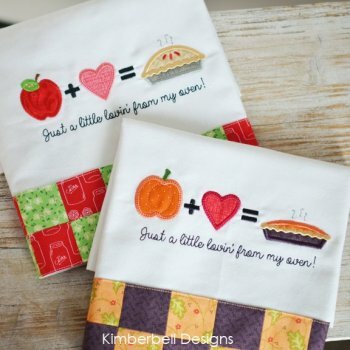 Choose to applique either apple or pumpkin for the sweetest gift or kitchen decor. We've included instructions for adding a checked fabric border to a tea towel, but the designs would look equally as cute on an apron bib for your favorite baker.